Call them what you like... footed legwarmers, knee socks... why one Mama loves Skights! What a great shout out from the head Mama over at mamanloupsden.com from Calgary, Alberta. Read what Lindsay (otherwise known as Maman Loup) has to say about Skights. And just in case you're wondering Maman Loup means "Mama Wolf" in french. You might have heard of baby legwarmers as great accessories for cloth-diapered bums … but legwarmers only warm legs. That’s why I love Skights! They’re footed legwarmers, or knee socks or however you want to describe them. It’s sad to cover up a perfectly adorable cloth bum with pants; with a pair of Skights, legs and feet are covered (and knees are padded) but diaper remains in view. It’s one part fashion, one part function. Diaper changes are much easier without pants! I like to use them on Little Miss when she’s got a dress on, but they’d be adorable with a t-shirt, too. For winter, I use them as an extra layer of warmth under her pants, and they guarantee her ankles are covered even when her pants ride up in the baby carrier or stroller. Just in time for the holidays (and the cold weather) the new Skights online shop is now live on our website! It's easy to choose your favourite colour and pick the right size, then check out and get our cozy socks to the little feet running around at your house. With lots of colour options for both boys and girls, Skights feature foot grips and padding at the knee. Perfect for underneath clothing to keep your little one warm and with a stay-put design to keep them in place — Skights are not easily removed by little hands. 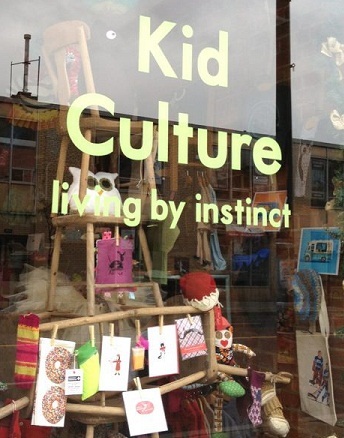 Fun, funky and proudly made in Canada! Share the news with your friends and come take a peek at the new shop today. A little sunshine on a chilly day! Baby it's cold outside. Get your Skights on! Celebrity mom, Sherri Saum has really been making good use of her pairs of Skights this winter with her twins. 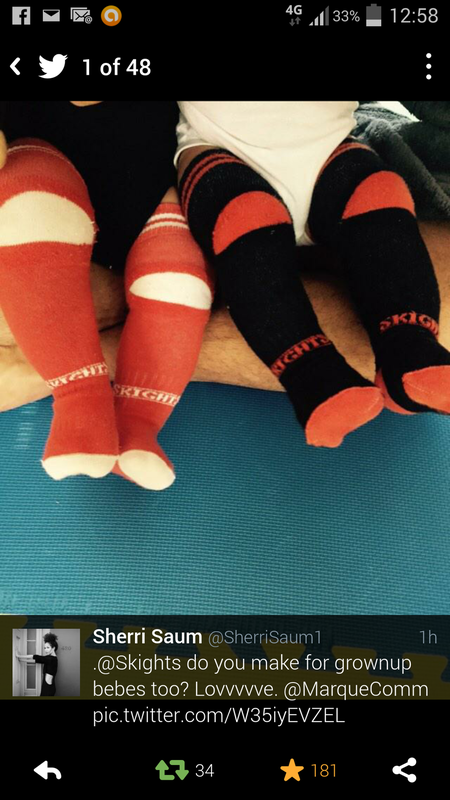 Here is a pic she posted on twitter of their little legs being kept warm and cozy in Lil' tights by Skights. Sherri Saum thinks Skights are Genius! This past spring we sent actress Sherri Saum a few pairs of Skights, while she was happily awaiting the arrival of twin boys, and she loved them! (Sherri currently stars as Lana Adams on ABC's family drama series, The Fosters). Congrats goes out to Sherri Saum and Kamar de los Reyes on the safe and healthy arrival of their little boys Michael and John. Best wishes and happy times from us here at Skights! We were so happy to hear that one of the top fun sites for naming babies, Belly Ballot, featured Lil' Tights by Skights as their weekly prize giveaway. Belly Ballot is a new social media site for moms choosing their names. They only choose the newest hip products to feature to their 180k moms, so we are flattered that they selected us! "The Lil' tights by Skights were a huge hit with the mommies on our site," said Ravit Dayan from Belly Ballot. "They're the cutest thing to keep our child's little legs warm and protected!" Loving these mommy reviews about Skights! "Even though, it says on the website that this are socks for little boys but I found they work great with my daughter. I would love to see in the future with so many designs for girls. My daughter is potty training right now. I found it is very easy for her to go potty without my help. Because these are socks, she hasn't got to take off her full body tights which is usually very hard to take it off. (Even for me to take it off for her.) I like that it makes my life easier." Read the full review here. "My first impression was that I wish that these had been around sooner! These would have been so perfect for the kids when they were crawling babies! The quality of these are amazing. They are soft, and they are definitely made with crawling children in mind. I really love the padded knee, and the stay put design didn't bother my son at all. They are obviously put together with love and with the knowledge of how rough little ones can be on their clothing. I was skeptical of the claim that the Lil' tights would stay in place but after putting them on my three year old, but I have to admit that they stayed on, and he needed my help to take them off. Best of all, my son LOVED them. He told me that they were his "special comfy socks" and that he was going to wear them everywhere once it was cold outside. That is high praise for a child who prefers to run around the house wearing nothing but a diaper!" Read the full review here. "With the weather we've been having, it is hard to know how to dress our little ones. Random heat waves, warm weather during the day, cooler weather at night, what is a mom to do? Is your little one crawling or just learning to walk? Do they spend more time on their knees then on their feet? Well then say Hello to Skights! They are the perfect item of clothing that will be a must have for your busy little mover. Skights are a great quality sock. They are made with cotton, lycra and spandex. They can be worn with onesies to protect the your LO's knees when they are crawling around the room or underneath clothes to protect them from the crazy weather that we get. They come in a variety of colours so they can go with a number of different outfits. I especially love that the knees are padded. Since wearing skights GM has had fewer bruises on his knees!" Read the full review here. "I bet you're probably wondering what Skights are? Well let me tell you. They're actually tights but better. What do I mean by better? Well tights come fitted all the way over my diaper and makes it so difficult to change when I'm dressed. Not Skights. They really make changing diapers a breeze. They are really thick and comfortable. Perfect for those colder days so little legs can stay warm and toasty." Read the full review here. Check out this little guy in Skights! What a great review from one happy mamma over at Did You Know Canada? which is perfect for my almost crawler, and they are SO CUTE!" A little press love for Skights! A few print and online publications we are so happy to have been featured in over the past few months! 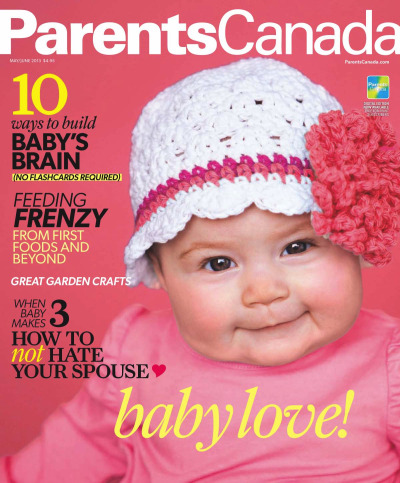 the best magazine and web site for Canada's working moms. See us in the Baby & Child Directory with tips by parenting expert Nanny Robina. The directory and planner is available for free at Sears and Toys R' Us stores. Find out how you can get your free copy here. If you are looking for a retailer in your area click here to view the list of retailers currently stocking Lil' Tights by Skights. You can also submit an order from our web site by clicking here. Happy 2013!!! As we welcome the New Year and all the potential it brings we here at Skights are equally as thrilled with the launch of our web site. This has been a dream come true — our signature product Lil’ tights by Skights has been over a year in the making. It brings me much joy to bring to you a product that I truly believe will be functional and beneficial to you and your family. Wishing you all the best in 2013 and may it be filled with love, laughter, happiness and joy.